Earlier this month, the AACC celebrated its 70th Annual Scientific Meeting & Clinical Lab Expo. However, more impressive than the advancements in clinical testing and technology, was the event’s attendance. The 2018 meeting welcomed over 20,000 professionals in the healthcare and medical technology industry – the meeting’s highest attendance yet (and an explosive improvement from years past). What is driving these attendance numbers? The robust show reflects the resiliency and boom we’re seeing in the global IVD market. In fact according to reports, this industry is projected to hit the $77 Billion mark by 2022 – just four short years away. This is a large jump from the $50 billion mark that the IVD market crossed in 2011 (a projected 54% growth in a little over 10 years). Historically, venture capitalists have shied away from investing in diagnostics, but the 2018 AACC meeting proves that mentality has changed … specifically for digitally-enabled diagnostics. 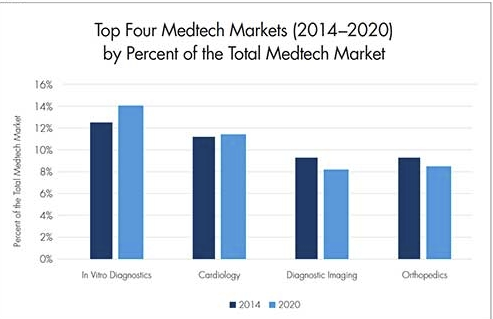 In 2014, the IVD market came from behind to become the largest sector within medtech and will continue that growth through 2020. In fact according to Deloitte, the single biggest driver for an increase in medtech Series A investments in 2017 were deals in the in-vitro diagnostics space ($118 million). Chart is from a 2017 Medical Product Outsourcing article. So, why have investments in clinical diagnostics quietly risen to record levels in the past few years? Let’s look at the driving factors from a product development perspective. Recent technological advances and automation are changing the way we understand and treat disease. At the same time, tools and devices are becoming less expensive and easier to use. According to the US National Library of Medicine, we are entering an era in which we can detect disease and predict its susceptibility with greater accuracy (and at an earlier stage), as well as predetermine an individual’s response to the drugs. Diagnostics is at the center of this change. Rapid advancements have enabled personalized treatment and home-based care in the form of blood glucose monitoring devices for diabetes patients, cholesterol testing, hemoglobin sensors, pregnancy detection kits, urine analyzers, hormone home tests, and more. A 2017 Forbes article predicted that established IVD companies and manufacturers would invest in digital strategy [in the near future] to make their business models patient-centric with consumer-friendly devices, embedded remote connectivity for real-time access to data, and to simplify sample collection processes. This is coupled with an increasing demand for technically advanced diagnostic devices, and an improved disposable income of targeted consumers. In conjunction with the rapid rise of chronic and infectious disease, the tests that detect and diagnose them before symptoms appear are becoming much more sophisticated. Rapid testing for respiratory viruses is a well-established market which can cut down on unnecessary usage of antibiotics or inform the prescription of antivirals. Even more impressive, test technologies are currently in development that will allow for constant monitoring of body chemistry and collection of previously inaccessible data. While the range of possibilities seem boundless, some of the main benefits of RDI include: earliest possible identification of cancer-causing mutations and infections; new treatments for chronic conditions; and detection of early signs of fatigue or stress that could be used to avoid accidents in high risk activities. Advanced technologies and changes in the healthcare ecosystem are driving transformation across the landscape. Given the scope and velocity of these changes, product development experts are challenged by keeping pace with competition from emerging markets, as well as the overall changes in customer behavior as well. Despite the value and potential of diagnostics, certain internal and external constraints like those surrounding reimbursement, protection of patient information and innovation challenges can inhibit the development and adoption of new diagnostic products. Bringing new IVD tests to the market does not necessarily translate to mass adoption. Diagnostics tend to be expensive and getting insurance coverage isn't easy, especially if the tool needs to get reimbursed by the US government. Clinical laboratories – understandably – want proof of clinical utility. However, to prove utility, you need to get the clinicians to adopt testing, which they won’t often do unless it’s paid for. Difficulty acquiring appropriate coding, coverage, and adequate payment/reimbursement can pose significant hurdles to adoption. Essentially, much of the testing must be free in the beginning stages of product development which many companies cannot afford without outside funding. Innovation remains a challenging pursuit as the process is undoubtedly arduous and full of uncertainty. Much like the groundbreaking innovations of the medical device and robotics industries, the IVD market looks like it will soon hit a turning point as well. Creating a “big new” or a “big different” product for your business requires innovative thinking, and innovative thinking requires the right kind of organizational environment. That is why innovation is so hard. It’s no wonder that innovation challenges can be daunting to many (however, we believe there is a process for successfully solving this very type of innovation challenge). The In-vitro diagnostics market is highly competitive and fragmented with several large and small players forming a competitive landscape. Despite the rapid growth in technology advancements and drug delivery methods, there are still challenges facing the IVD market due to the very nature of growth and innovation.